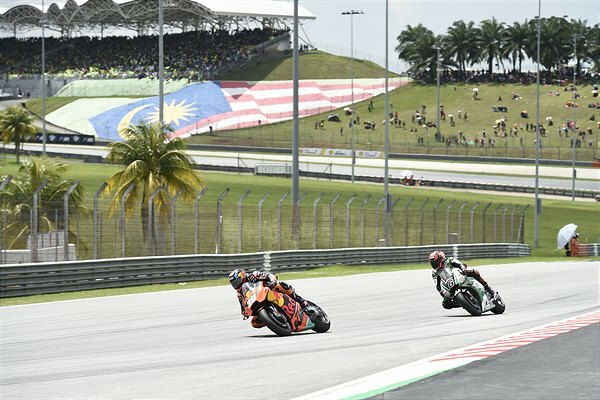 The tricky climate and technical prospect of the Sepang International Circuit created another unpredictable and challenging Grand Prix of Malaysia for what was the penultimate fixture on the 2018 calendar and the third race in a week. Red Bull KTM returned to the site of their opening test of the year and a term in which they have made significant progress in chasing the leading factories and top ten of the premier class grid. 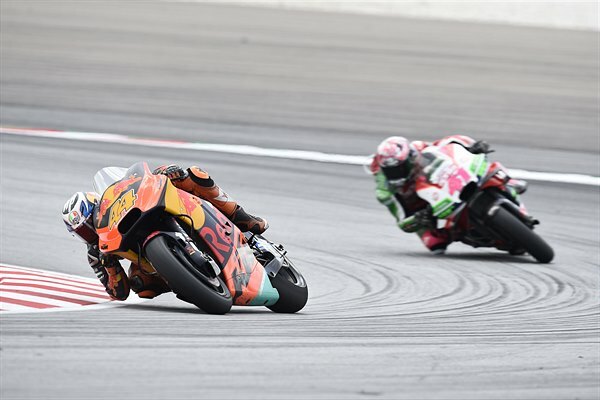 The mix of dry and wet conditions on Saturday meant a sixth row starting berth for both Pol Espargaro and Bradley Smith when the red light closed for the second-to-last race of the season. Thankfully the track was dry and the temperatures were high after a weekend of varying set-up work with the KTM RC16. 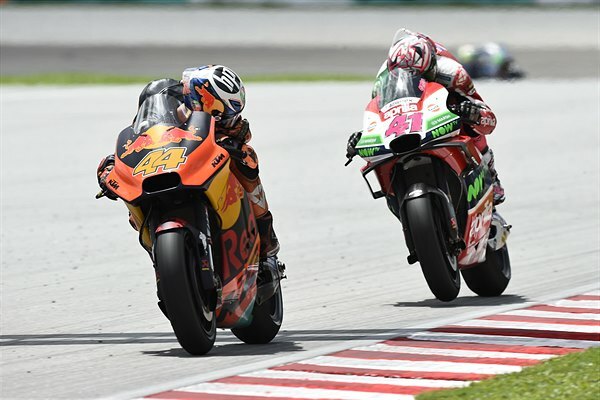 Both riders circulated on the border of the top ten in the formative laps as the combination of pace and heat took their toll on the race rubber. Smith battled adversity and maintained a rhythm to classify 15th and obtain points for the fifth Grand Prix in a row; his longest streak of the season. Espargaro unfortunately drifted back and out of contention for tenth position with a technical problem. 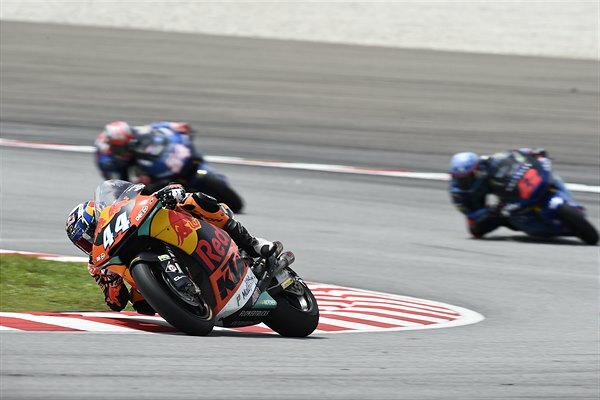 Red Bull KTM Ajo’s Miguel Oliveira pushed Luca Marini hard in an attempt to win the Moto2 Grand Prix at Sepang. 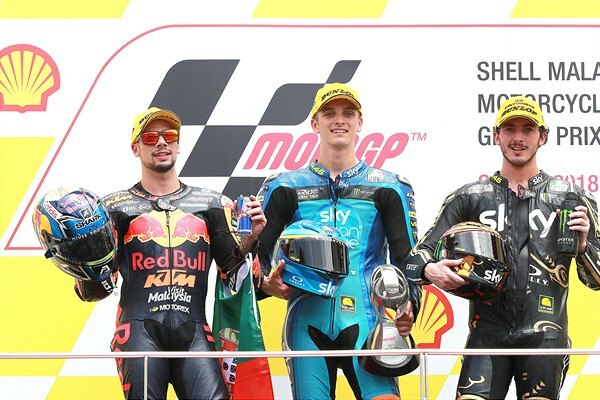 The Portuguese ended up second with his KTM Moto2 on the podium – back in the top three after missing out last week in Phillip Island – but the presence of Francesco Bagnaia in third place finished the season-long championship dispute in favour of the Italian. 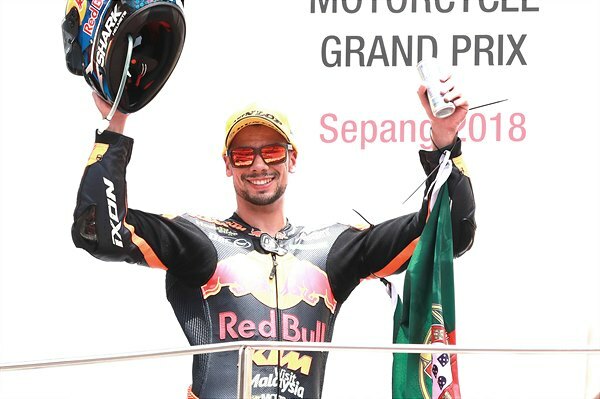 Miguel is already confirmed as 2018 runner-up courtesy of his points tally and teammate Brad Binder is third for the year after taking 8th place in Malaysia. Oliveira: "This was a Grand Prix in which we went very well. 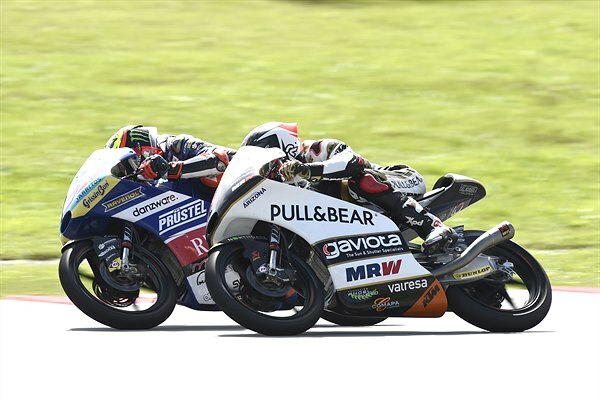 From the beginning I felt good, but Pecco (Bagnaia) was also strong; I was able to pass him and I went after Marini. Finally I couldn’t get close enough to overtake him. It was a very hard fought race. I’m very proud of the efforts I have made this year, of my riding, my season and our perseverance, although unfortunately it just wasn’t enough to beat Bagnaia. Pecco has been very strong and we have both been very consistent. We have battled with everything we had, my team have done a great job and I have also given 110%. Overall, it has been a season full of emotions that we want to finish with a victory in Valencia." 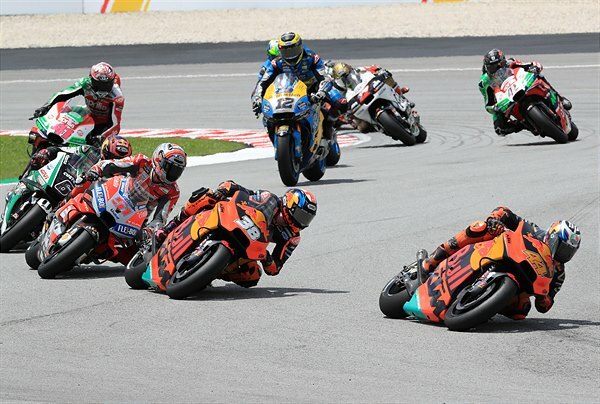 Aki Ajo (Team Manager Red Bull KTM Ajo): "Miguel (Oliveira) had a great race. He has been fighting hard all weekend and was very focused and confident, so we expected a strong race. He fought until the end to win, because it could be the last chance to keep the title race open for Valencia. Unfortunately, despite his great performance, it wasn’t possible. Even so, we can’t be disappointed with the season we have had, because in the end our riders are second and third in the World Championship – but it is obvious that we all prefer to win. Congratulations to Bagnaia and his team. For Brad (Binder) it was a difficult race because first he was caught in traffic and then it was impossible to climb positions, because he had grip problems. We need to analyse what happened. We are very motivated for Valencia. We want to get a good result there and fight for the Team World Championship." In Moto3 Jorge Martin claimed the chequered flag. 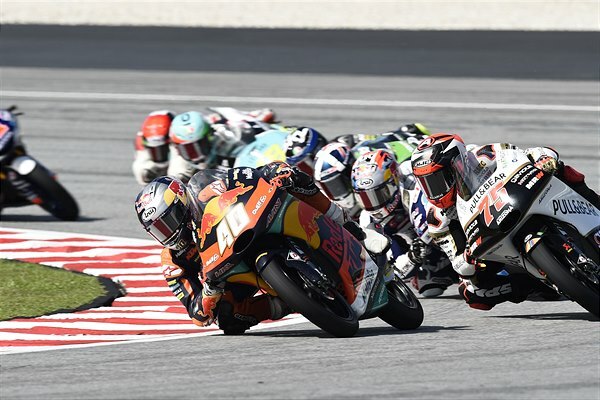 Red Bull KTM Ajo’s Moto2 rider for 2019 also sealed the 2018 championship by one point as Marco Bezzecchi could not finish higher than fifth and was just one position behind Australian Grand Prix winner Albert Arenas. MotoGP now travels back to Europe and for a week of respite before the traditional season curtain-closer at the Ricardo Tormo Circuit in Valencia, Spain.